Spain is bankrupting, its central government is bankrupting, its local government is already bankrupt along with most of its banks that have been busy hiding most of their bad loan losses on crashed property developments. The credit markets despite ECB support are fast closing to Spain as it is being forced to pay credit crisis extreme financial armageddon rates of interest to borrow. Spain's economy is in meltdown, the adult unemployment rate of 25% is higher than that of bankrupt Greece and the youth unemployment rate of 50% is at critical social unrest inducing levels. Money is flooding out of Spain at an estimated E33 billion per month! 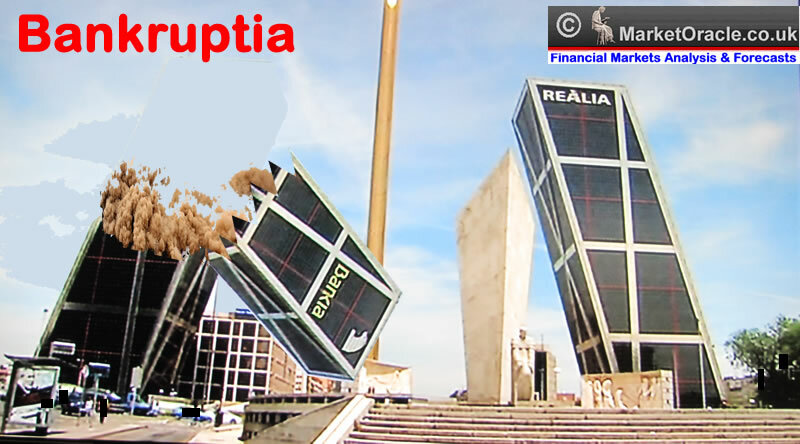 These bankrupt Spanish banks are being downgraded on a near weekly basis, and the most recent news is that Spain's fourth largest bank, Bankia or Bankruptia is on the verge of toppling over, demanding the state bail it out to the tune of Euro 29 billion, money that Spain just does not have. Spain in desperation has attempted to get the ECB to start footing the bill for bailing out Spain's bankrupting banks, the ECB has said No to the Spanish governments attempts to get it to effectively monetize Spanish government debt through the back door for it knows it won't stop at Euro 29 billion, but soon turn into a flood that will run into the hundreds of billions, when the EU only has a bailout fund left totaling Euro 200 billion. Spain has flashed financial armageddon and is on the brink of demanding hundreds of billions of euro's in bailout funds to delay bankruptcy, the question mark is Spain too big to bail, because the price exacted on primarily Germany will be several orders of magnitude greater than that expended on Greece, all without a positive outcome. In my opinion, Spain will demand a bailout within the next couple of weeks, probably coinciding with the Greek elections, and it WILL leave the Euro-zone. Portugal is ahead of Spain in terms of financial armageddon, already has a Euro 80 billion bailout fund that it's bankrupt banks are busy squandering and government using to finance its budget deficit. What happens when the bailout money runs out (which it will do sooner rather than later). Ireland has just frightened into voting in favour of austerity for continuing euro-zone bailout cash. The facts are that Ireland's banks have bankrupted Ireland and Ireland remains PERMANENTLY reliant on Euro-zone bailout funds to keep it's economy just flat-lining. The Irish people are in a state of denial, they just cannot comprehend the fact that Ireland is bankrupt. Until the Irish people realise this fact then Ireland will continue to suffer indefinitely as periodically it's bankrupt banks will declare MORE hidden losses and request MORE bailouts of a country that is broke and Ireland will then have to agree to even more austerity if it is to be in receipt of its NEXT German bailout on top if the Euro 67 billion to date. Italy remains precariously perched on the edge of financial armageddon, somewhere in between France and Spain. Whilst financial armageddon does not appear imminent, however it would not take much contagion from Greece or Spain to tip Italy over the edge requiring a bailout of several orders of magnitude greater than that which Spain will soon be requesting. Italy is the huge ticking time bomb that looks set to blow the whole euro-zone apart. Italy WILL leave the euro-zone so that it can resume doing what Italy is best at which is printing money and debasing its currency. Some good news for France, the ejection from office of Sarkozy has resulted in France being seen as a Euro-zone safe haven benefiting from panicking euros from the likes of Spain and Portugal that has been flooding into French government bonds. Thus buying France some time. Unfortunately it does not make any difference what happens to France, because it is no longer part of the decision making process or the centre of Financial Armageddon, instead France is a bystander waiting for Euro-zone collapse to play out. Germany remains the defacto eurozone safe have as interest rates continue to trend to record lows as panicked depositors flock to buy Germany bund's, so as to preserve the value of their fiat currency, because everyone knows that when the dust settles, only Germany will be left standing as the likes of Drachma, Spanish Peseta, Portuguese Escudo, Italian Lira and French Francs plunge against the Deutschmark. Euro-zone citizens have the potential to make huge profits when after Financial Armageddon funds are converted back into their domestic currencies because they will not be holding Euro's they will be holding Deutschmark's!. I still see commentary in the mainstream press that Germany will ride to the rescue of the eurozone because they cannot allow the Euro-project to fail. Which is true, that Germany well understands the character of its own nation that requires it to be binded closely to the rest of Europe, which has brought 60 years of peace. However Germany also knows the price for Hyperinflation (which the bankrupting euro-zone are effectively asking of Germany), is ultimately WAR. Germany IS bending over backwards and IS paying an increasingly heavy price, even thought it knows that all of the money it commits will ultimately have no effect in preventing a collapse of the Euro-zone. Germany is paying this price so that when the Euro-zone does collapse it is not seen as the victor as in the past by the rest of what was the euro-zone but to have also suffered a huge loss as a consequence of euro zone banks and governments defaulting on monies borrowed from German tax payers. Bottom Line - All Euro-zone citizens should pile into German Bund's ahead of Euro Collapse because they would make a huge profit when their new currency collapses against the Deutschmark and even if by some miracle the Euro-zone does not collapse, at least you can sleep easy knowing that your money is relatively safe. So Where Does that leave Britain? Britain continues to benefit hugely at the Eurozone's expense despite on many measures being just as bankrupt as states on near triple the interest rates. Britain is a very temporary safe haven that will have now choice but the ramp up the inflationary money printing presses again to meet the immediate consequences of Financial Armageddon as the UK desperately attempts to prevent it's big banks from collapsing from the hundreds of billions that would be defaulted on owed to British banks from across the euro-zone. A sub 2% bond yield on an 3% inflation rate is not a sign of health it is a sign that any resolution to the eurozone crisis either good or bad could result in the evaporation of much of Britians safe haven status and the problem for bond investors is that during financial armageddon this switch in market sentiment could literally take place within a matter of hours, so rather than a safe-haven British government bonds are more akin to people jumping from sinking euro-zone life boats onto the British Titanic. In reality Britain at best should be on par with France in terms of bond yields, so whilst the gap between UK and French bonds has narrowed, there remains a significant risk of the gap evaporating (falling UK bonds) on euro-zone breakup. The bottom line is that all roads lead to only one solution as voiced at length in the Inflation Mega-trend ebook of near 2.5 years ago, in that at the end of the day governments have only one choice which is to print money and inflate and that is exactly what all the countries outside of the euro-zone have been engaged in and is exactly what all of the bankrupting euro-zone member countries will ultimately engage in which looks set to continue to Feed the Inflation Mega-trend that has so far largely passed by academics that continue to argue the case of non-existant deflation. For it is important to get this right for it determines the mega-trends for markets, it determines if we have a multi-year bull market in stocks or a multi-year bear market. The debt and deficits crisis is all relative as long as countries can print money, which means they will monetize it all. How far will they go ? We shall soon see, but for now we are in an continuing Inflation Mega-trend and have been for the past 3 years whilst the academics continue to argue the case for debt deleveraging deflation which I warned was a red herring over 2 1/2 years ago - 18 Nov 2009 - Deflationists Are WRONG, Prepare for the INFLATION Mega-Trend. The bottom line is that most of the Euro-zone countries are heading straight for inflation hell, how much inflation is difficult to estimate as Inflation tends to act as a feedback loop courtesy of the wage price spiral, but a good initial pointer would be euro-zone country specific respective 10 year bond yields which suggests Greece can expect an Inflation rate of at least 30%, Spain 7%, Portugal 14%, Ireland 8%, Italy 7%, and on the flip side Germany on far lower inflation rate of sub 1% if not outright deflation! Which I am sure that ALL of the academics will solely focus upon. The unknown quantity is France, my best guesstimate is that French inflation will be somewhere near that of Britain's 3%. All politicians only have ONE answer to crisis and that is to print money, the Euro-zones response to Financial Armageddon will be no different, because as the bank runs accelerate from the rest of the PIIGS following a Greece Exit then so will the response from the ECB to provide unlimited liquidity in an attempt to ensure the euro-zone banking system does not collapse. All of that money printing will be highly inflationary as the flood of euro's will plunge the single currency as depositors seek relative safe haven currencies. An Inflationary Depression is generally good for asset markets and commodities as ever increasing volumes of fiat currency cycles through sectors, creating ever expanding cycles of booms and busts as part of the ever expanding Inflationary Spiral, as countries engage in COMPETIIVE INFLATION. So next time you hear the Deflation mantra, ask them "so how come the prices in the shops keep going up?". Don't be brushed aside by BS to justify being wrong such as reference to the Dow / Gold Ratio, for one thing academics are good at is showing lack of consistency, hopping from measure to measure to justify being wrong. When inflation is exactly what it has always been which is the measure of general prices of goods and services in an economy that anyone with any commonsense fully understands. Financial Armageddon WIll be Good for the Markets! Now, this WILL NOT be apparent in the Price charts because uncertainty EQUALs volatility in Market price Junctures, it is NOT TREND ANALYSIS, and it is not Juncture Analysis, It is what should be termed as Uncertainty Dissipation Analysis. To realise when uncertainty is dissipating the signs for which are not only to watch for unfolding news events but in inter-market relationships, because not all markets turn at the same . Gold has a dual role, in that it is both a trending market and a safe haven (at times), the very recent reversal in Gold is a sign of the dust starting to settle in terms of approaching resolution of the uncertainty surrounding Greece and market realisation of where rest of the Euro-zone is heading (for the exit). This is what Gold is reacting to. 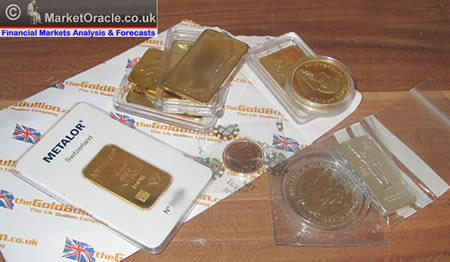 Whilst it has been quite a while since I last looked at or traded Gold, however I have seen an opportunity to add to my physical gold bullion holdings on the sell off below $1600, which I do not class as an investment but rather some insurance in case SHTF, because I will only ever call on bullion holdings when everything else has gone up in smoke! My strategy all along since Mid December has been to sell into an expected early year rally as opportunities presented themselves to offload individual stocks, which had taken my holding from 40% of assets in Mid December to about 10% a month ago and more like 8% today. The ongoing severe sell off in stocks is perking my interest into buying back into target stocks. I will look at detailed analysis of stocks and Gold in future newsletters, ensure you remain subscribed to be my ALWAYS FREE Newsletter to get this analysis in your email in box. Your analyst ultimately seeing Euro-zone Financial Armageddon as a positive resolution to the crisis. What's ur opinion on uk direct REIT's? I guess you haven't been posting about the stock markets as much this year because it isn't such a big part of your portfolio? Given the potential for Eurozone chaos this year, do you still stick by your February stocks view that 12,000 DOW would be a good buy? Or do you think something has changed such that you wouldn't buy back at these levels? "So putting both together implies a trading range for the Dow of between 12000 and 14,200 for possibly the next 2 years! The immediate picture is that of consolidation so suggests most of 2012 could see the Dow gravitate around the 13k level, perhaps spend most of the time trading in a range of between Dow 12,500 to 13,500 punctuated by occasional temporary spikes above 14k and plunges below 12k. So the Dow appears as if it will mark time during 2012 by giving plenty of false hopes to both bulls and bears during the year." 04 Jun 12, 18:52 stocks buying? 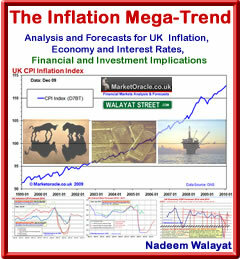 Yes, those and many mentioned in the Inflation Trend EBook. My strategy since the birth of the this bull market in March 2009 has been pretty simple, which that the greater the deviation from the High the greater the buying Opportunity. Yes, I blinked in Mid Dec, and felt fear that the risk of Financial Armageddon was a lot higher than I thought it was so I saw the risk for stocks for 2012 being far higher than the potential rewards and acted accordingly to reduce risk. At the end of the day it comes down to risk vs. reward. And the risks even after the recent sell off are still pretty high because the risk of financial armageddon has INCREASED. Two things before I add to stocks. However, I expect the mega-trend (of rising stocks) reassert itself at some point, for which there will be plenty of signs i.e. dissipation of uncertainty. In addition to Eric's comments which would be on all our minds, could you provide a quick updated DOW or S&P 500 chart with arrows and shaded trading range areas? The last two posts are greatly appreciated, but at the risk of sounding disappointed, I think us loyal followers would greatly & sincerely appreciate more Stock Market related feedback in these current stormy financial conditions. Ive tried to generate a stock trend forecast chart, during the process of which I have a series of what if questions answering, which articles such as this answer. There is no point in me posting an article which says stocks could go up or down, that is not my style at all. I answer the questions I ask myself so that when I write a forecast for stocks or any other market or indicator it is with conviction that I think it is high probability outcome, and then I go and act on it with my own money. I don't put my own money on 50/50 propositions. I could post a long winded analysis of the stock market that concludes that there is a 50/50 chance that stocks have bottomed, but it would to all intents and purposes be worthless as far as I am concerned and you too! The questions need to be answered, so that I can arrive at the stage of generating high probability forecasts, there is no short-cut. My next question is where will the growth come from, which I am answering and will post and that work is on par with the two posted today. Great article again - thank You for it! Considering the eventual break up of the euro zone what is acording to You the setup when the value of the euro will decouple from the commodities and hard assets? Please do not insult us that this is not found in economic literature. The Austrian economists are a part of the literature and have been predicting this far longer than you did. Incase you didn't notice, http://www.mises.org/ has been in operation for quite some time. I don't subscribe to any economic school of thought that usually look in rear view mirrors to pump out theories explaining what has already happened , so when someone says keynsians, or austrian or any else, I automatically turn off. "What the academics FAIL to understand as I have been writing of for several years as to why we will have an INFLATION MEGA-TREND is because Economic Recessions, Depressions and Meltdowns result in the destruction of SUPPLY that is GREATER than the destruction of DEMAND!" Please feel free to point me to an article that suggests the same, bare in mind this has been my conclusion for several years, that has been bourne out by economic reality. Now, I am not saying that economic theories are worthless, I am just ssaying that they must be dumped when they are seen to NOT WORK, rather than build up an ediface surrounding them to level of religion which academic economists are good at doing. Whereas I try to keep it simple, and straight forward, no hokus pocus fancy theories, but firmly rooted in ECONOMIC REALITY - If you read my articles carefully you will SEE REAL evidence, NOT THEORY but REAL EVIDENCE of the INFLATION MEGA-TREND ACROSS THE GLOBE. If your referring to something else, i.e. euro collapse, then offcourse there will be many that will have forecast as long before me, with some as far back as 10 years ago. But forecasts without a time table are pretty worthless. Like a few perma bears I could name who have remained stuck in a bear market mantra for 20 years! Eventually a bear market comes along, but if they had followed their own advice then they would have gone broke many times over, same goes for perma euro collapse merchants. Though I think they remain far more out numbered by the perma dollar collapse merchants. My conclusion of euro-zone collapse follows the French and Greek elections , with the timetable laid out for Greece to say bye bye by early Sept and Spain and Portugal to follow within 6 months. Yes, those and many mentioned in the Inflation Trend EBook." The inflation risk stocks Oil Ag commodity stocks have been battered mainly because the Brics look to be slowing. Volality will be high as we approach and pass through the eye of the FA storm. When you consider foriegn stocks remember to take currencies into account as well. The bottom line is that there will be a flood of money that will find its way into the likes of emerging markets , commodities and commidty stocks, and off course UK house prices! In fact if or rather when the euro-zone collapses, London house prices will SOAR into the stratosphere ! Crikey I am sounding like a housing bull ! But that is the logical conclusion when you see money literally flooding into the UK, 1.5% interest rate for uK bonds ??? That is the mother of all money flood tsunami's that will push up UK house prices sooner or later regardless of economic fundementals. Perhaps its high tide I did an article on UK hosuing next! I am sure I am not alone in being dissapointed, having eagerly anticipated an update on where you think the stock market will go. Whilst this is useful, many of us read your articles for your insightful market forecasts. Please give us a clue on what the market will do next. Stock and financial, commodity market trend analysis have always been about 20% of my analysis, it's what I tend to do AFTER I have answered all of the fundemental questions, unless I have a Eureka moment, but even they usually occur when I am performing fundemental analysis. c. That a wall of money is flooding out of the Euro-zone into other assets. So if I had done stock market analysis before performing this analysis, not knowing or have incorrect conclusions which may have resulted in a far less probable forecast. Now, I am about 60% ready for a trend forecast. I could do stock market trend analysis on the basis of existing preliminary conclusions on these two topics, which may nor may not pan out. So overall I could say I have an 80% confidence in preparedness to do a stock market trend forecast. My focus on at present is the Inflation mega-trend expectations for the UK, in the process of which I am being led towards analysis of UK house prices, so stock market analysis now would be outside of the where my analysis is logically leading me, and it's not wise to force analydis of a market. What do you make of this, and would you consider it yourself? I don't know much about economics, but I wouldn't touch this with a barge pole. Great work. If central banks keep printing money but the money is not channeled to people who want to spend it and need to spend it and we continue to have an economy where excess money is going to the wealthy and the big corporation who in turn just park it in short term treasury securities. Example Apple, Microsoft, Exxon, etc. with big balance sheet but stagnat use of the money. In turn causing no money velocity can we still have inflation or will we just have asset bubbles. I think that the fiat currency has created a new deminsion where you can continue to print money and had very little inflationary effects. Your thoughts on this will be appreciated. Greece shows that academic theories of what should happen, don't happen - as Greece has seen its economy and wages collapse but STILL has had Inflation of 10%. You have to remember that you, me, everyone is swimming in a deflation propaganda soup. We are being blinded to the reality that we are in an period of Expoenential Inflation. The amount of money printing inflation is such that it drowns out ALL deflationary forces. Academic economists are part of the problem, because they write as though they are certain, highly convincing arguments, but in reality when one looks at the real world, one sees that they know NOTHING !!! GO CHECK the FACTS, Go CHECK 70 years of economic propaganda against the Facts of Expoenential Inflation.